Cow Colostrum rich source of immunoglobulins, provide “ready to use immunity” to fight against range of diseases, it contains range of vitamins, minerals, essential and non-essential amino acids, various enzymes and their precursors, growth factors and other important growth regulators to “re-vitalized the body functions”. It is the “First Milk" given to a newborn calf by its mother, and contains many bioactive compounds not present in ordinary milk. Colostrum is normally secreted only in the first 48 to 72 hours after birth. OjWel is 100% bovine colostrum, collected within the first 12 hours of production. It is then standardized so that certain key proteins found in colostrum make up 30% of the finished product. It actually replenishes your immune defense system with the full range of Immunoglobulins including IgA, IgD, IgE, IgG and IgM. Colostrum is the only supplement you can take to add back antibodies and immune factors. 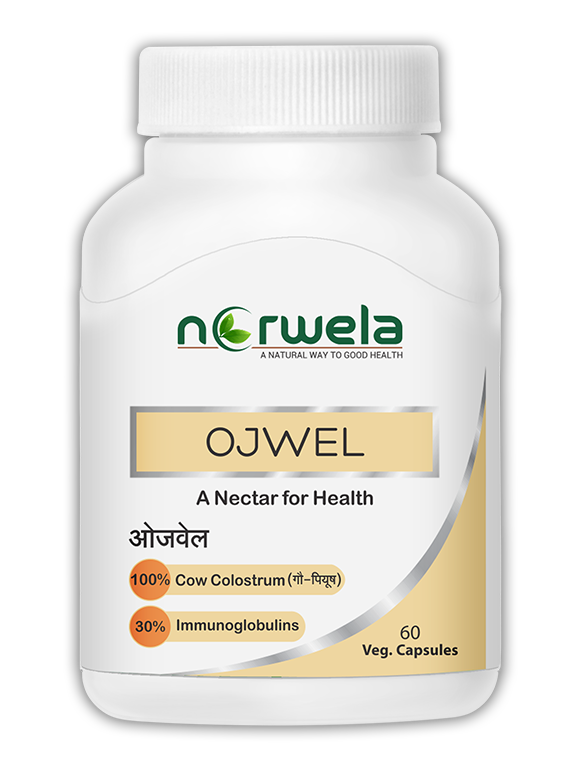 Ojwel helps you maintain a strong immune system with dual action in the bloodstream and in the GI tract where your need for immune defense is greatest. It helps maintain a robust intestinal lining and promotes healthy intestinal flora.